Tide laundry detergent has been faithfully cleaning America's clothing for generations. However, do you know what exactly is in that powder or liquid you are pouring into your washing machine? Especially for families that have sensitive skin allergies or are striving to be environmentally friendly, it can be helpful to know exactly what's in your box or bottle of Tide. The original orange-packaged tide that your grandmother always used is still providing a great, clean laundry solution for countless modern families. Outside of the standard powder that is still readily available, the liquid concentrated Tide is also a hit. While most concentrated detergents are made up of sometimes 80% water, Tide has more cleaning ingredients and less watered down aspects, allowing it to pack a powerful punch without ruining your clothes. So what exactly is in this magical powder? Tide is made out of surfactant molecules, which have two components - water friendly and anti-water. The water friendly ingredient is called hydrophilic and breaks the water's surface tension. The anti-water component (also known as hydrophobic) attracts soils and stains, freeing them from various types of fabrics. In Original Tide, you will also find fluorescent whitening agents to help brighten clothes, enzymes to remove tougher stains such as blood or grass marks, and various fragrances to help provide a fresh scent. 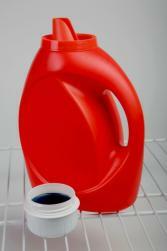 For a complete list of ingredients for any Tide laundry product you can check the Tide website. Everyone from young children to mature adults experience a negative skin reaction at some point in their life. However those with chronic issues such as eczema or contact hives may benefit from a sensitive skin-designated laundry detergent. Tide Free (for sensitive skin) is free of all dyes and perfumes found in your standard detergent. It has been dermatologist tested to ensure no irritants ruin the promise. Tide Free also includes ethanol, monoethanolamine, sodium borate decahydrate and sodium hydroxide. Again, for a complete ingredient list, check your packaging or the website. In this list you will also find "active ingredients" including hydrogen peroxide, which can be controversial in the arenas of personal health and environmental responsibility. If you're concerned about Tide laundry detergent ingredients, you might choose a natural or organic alternative. 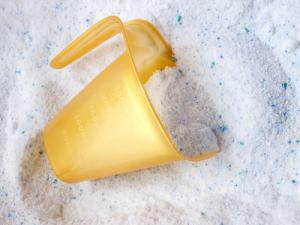 You can also make your own homemade laundry detergent. Environmentally, laundry detergent isn't so great of an option. But for many it is a necessity, and companies like Tide are trying to find a compromise. With Tide High Efficiency, you can enjoy a super concentrated formulation that uses only a very small percentage of the water used in traditional loads. To use Tide HE, you must have a high efficiency washer, but once you have purchased one you can enjoy the environmental friendliness of getting more loads done with less detergent used. Finally, if you love the idea of going natural with your laundry, check out Tide Pure Essentials with Baking Soda. As the name suggests, the key ingredient found in this formulation is baking soda, giving your fabrics a gentle wash that is complete and effective without shortening the life of your clothes.